YOU GUYS! Jord and I are in our new home. Our first actual home that we can call ours. No more rent and sadly no more NYC, but we are so grateful to be in such close proximity to the city from here in Hoboken. I have been planning a TON of exciting content for you guys all about our new home and some of the projects we are working on. I’ll be capturing a lot of the projects and featuring some of my favorite products and more to share with you all. All things kitchen, linens and more! And if you have any requests, hit a sista UP! But first things first, the PANTRY and KITCHEN! Aka my home base in our apartment. My happy place and where I spent 95% of my time when I am home. As soon as I walked into this apartment, I saw the coat closet and immediately knew what had to be done. We needed to turn this into a pantry. Who needs coat closets anyways? I’d much rather stack my nut butter than look at boring jackets in there. 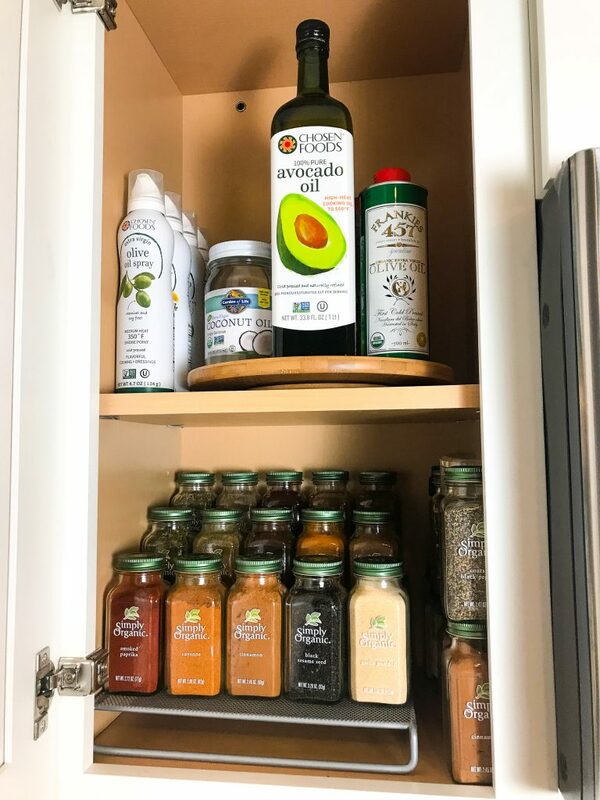 I worked with California Closets to maximize the space of the pantry and install some shelving units, two drawers and a few cubbies on the side. I wanted to keep things as simple as possible and really take advantage of the size of the space. We decided on five large shelves, two drawers, three little cubbies, a baking sheet cubby then the bottom would be left open for water bottle cases or baskets as you will we currently have. When it came time to actual putting the food into the closet, I wanted to make sure there was thought and planning behind where all the items would live. I also wanted to make sure everything was neatly in its place and easy to find and see. I had heard amazing things about Jamie’s work, the mastermind behind Horderly. I immediately called her to come over and help me figure out how to organize my apartment and most importantly, the kitchen and pantry. As soon as she came to my apartment we had an immediate connection and I actually have never been more obsessed with a human. She is AMAZING!! To get an idea of what we were working with in the pantry, Jamie took everything out of the closet that I basically threw in there and we categorized everything so that it had a theme of sorts. From there Jamie recommended the items to buy from Bed Bath & Beyond. Let’s start from the top of the pantry and work our way down, shall we? We purchased two turntables from Bed Bath & Beyond that live on the top shelf. One holds all of our canned and jarred goods and the other is for condiments and dressings that are not opened yet. Since these aren’t items I use daily, it makes the most sense to keep them up top and I can easily spin the lazy susan to get an idea of what is on each. I highly recommend these! So helpful. Next on the second shelf, we kept all breakfast items baking supplies like sugars and flours, mixes, etc. I received some of these jars from Bed Bath & Beyond to hold my oatmeal in and also these take up less room than the usual container I buy my oats in. Plus you can easily see the inside of the glass jar. The third shelf we have two baskets (I used these from BB&B) and glass jars (linked here) that hold my pastas and quinoa. The baskets are for dinner supplies like rices, kelp noodles, etc. The other basket has my hemp and chia seed collection. Basically the seeds I throw into many of my meals! The fourth shelf is my protein and powder supplement collection with a basket of my travel packets in the center. I LOVE how this is set up. 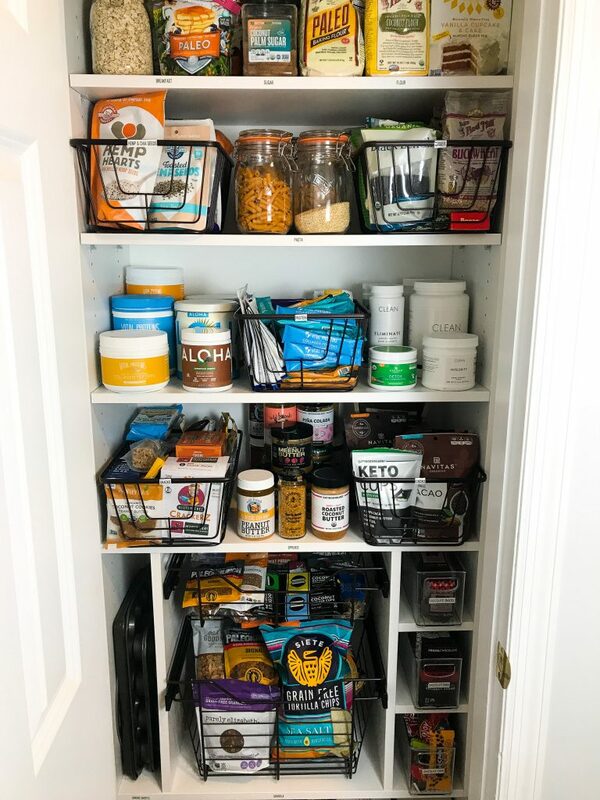 Jamie put the large proteins in the back and having the clear bins in the middle with travel packets, allow me to easily see what I want to grab and take on the run with me (link to the bins here). She also recommended taking everything out of boxes (like the protein packets) to really maximize the space so it wouldn’t be as bulky! 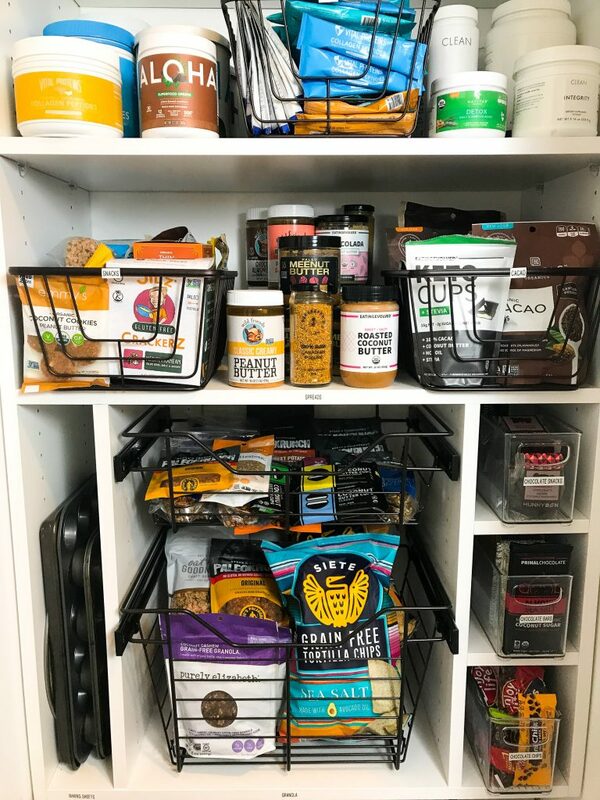 The fifth shelf (I know, tons of shelves haha) has my snack and cacao baskets (same as above) and in the center are all my spreads and nut butters. I like to organize them by expiration date so I know, which to use first. The sixth shelf isn’t exactly a shelf but it is two drawers, a slim cubby for my baking trays and three small cubbies on the side. We put my large granola bags in the big drawer and small travel packets in the smaller drawer. I love having these so visual because it really allows me to look and figure out what I want to use. My last pantry was shoved in the back and I couldn’t see anything! The three cubbies on the side have the cutest plastic bins that hold my chocolate snacks, bars and chocolate chips. Basically the chocolate section. These plastic bins from Bed Bath 7 Beyond were perfect to fit in the cubbies and easily pull out like a drawer. The bottom of the pantry currently has a basket filled with my favorite tortilla chips and I keep any boxes of beverages or water bottles on the side. Are you exhausted just reading this yet? Because we didn’t even get to the kitchen yet! Can you imagine how much energy Jamie has? She just kept plowing away like a super woman. She moved right onto the kitchen from the pantry and grouped together everything in categories again and organized the kitchen from there. 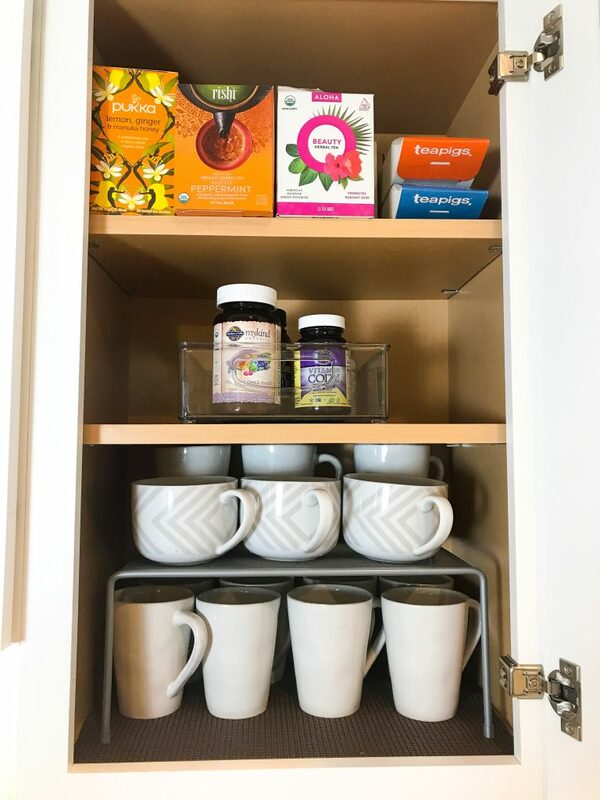 Creating a “morning cabinet” where you house your tea, coffee, daily vitamins and mugs. We used this large helper shelf to add more shelving to the cabinet and this plastic tray to house all of the vitamins and supplements we take daily. Adding bamboo organizers/cutlery trays to our flatware drawers and cooking utensil drawers to keep them from getting all mixed up. Putting your spices onto an expandable step shelf. This helps to keep the spices so organized and you can easily see them! Storing your daily oils and sprays on a bamboo turntable on a shelf. I am officially obsessed with these. I have my avocado oil, coconut oil, and sprays on top so I can easily spin the turntable and find what I am looking for. I am beyond impressed with Jamie’s organizing skills from Horderly for the pantry and kitchen and Bed Bath & Beyond as an amazing destination for moving into a new home (plus they have this AMAZING 20% off your PURCHASE coupon like what?!?!? ), they have everything you need to help furnish/organize your space! Plus it is super easy to shop in-store or online. I did a mixture of both and it was such an unexpected place to find what we needed! And I’m not going to like, this whole experience was weirdly refreshing and fun! Stay tuned for some more home-ish things during this new series on the blog. So excited to share with you guys! If there is anything you would like me to capture, of course let me know! This post is in partnership with Bed Bath & Beyond. All opinions are my own and products were received as compensation for inclusion in this post. omg i love this. and all of this nut butter is making me hungry. Congrats on your new home!! I think you’ve got the best of both worlds having a house, but still being able to go into the city when you want. Damn this pantry! Seeing all the goodies in there reminded me of going over to the house of the friend with all the good snacks as a kid haha. You’d totally be the winning home. Thanks so much for sharing this! I just moved into a new place and am definitely converting my coat closet into a pantry – so much inspiration here!